Achieving success on Instagram isn’t an overnight thing. As a matter of fact, there are many factors that contribute to the success (or failure) of your Instagram marketing. There are more than just a ‘beautiful photo’ that makes the post being shared, liked and commented — which we will be going through in this post. These are the general guidelines in creating the perfect Instagram post and the success opportunity lies within your niche and followers. So, it is highly recommended to tweak and modify these strategies to fit your requirements. I hope you are ready for this as in this post, you will find 9 powerful tips to create the best Instagram post (and having higher chance of making it go viral). If you find this article useful, I would appreciate if you leave a comment below (to tell me what you think about it) and share it around! The human mind processes images faster than words. To be exact, 60,000 times faster. When it comes to creating images or photos that capture the eyes of the audience, clarity is important to ensure that your followers understand the meaning of the image. It could well be a simple image, mesmerizing photo or a motivational quote. The message must be extremely clear for the readers or followers. Marketing on Instagram is considered visual marketing and this means that you should only use high quality images. Official Instagram app on smartphones allows you to crop and modify the images before sharing. At the same time, always take images with a higher definition camera. If you can’t afford one, use your smartphones to capture the image and ensure that the focus (and lighting) is right for the shot. You will be surprised that human are more attracted to high quality images compared to those which are blurry and unclear. If you are a beginner or a ‘less creative person’ like me, Instagram could still work for you. All you need to do is to utilize the default filters in the Instagram app. Make no mistake. These Instagram filters could easily turn a badly taken image into a super, mesmerizing one in under 5 seconds. Always remember that using the right filters is important to ensure that it is easy for the eyes and interpretation of the message. Want to increase the engagement level on Instagram? Always reply to the comments you received on Instagram. Science proves that the right words will impact a person’s mind — the same goes to Instagram posts. Of course, you shouldn’t be using them in every-single post that you have published. Instead, using sparingly could lead to many advantages for your Instagram marketing. Motivational quotes are also powerful ways to boost your post. After all, majority of us dig into motivational quotes and you could hardly go wrong with that path. Asking the right question, at the right time is powerful. Most importantly, you shouldn’t be worried to ask questions on Instagram! Remember the latest photo that went viral across all social media about the dress colour? Yes! That’s exactly what I am talking about. Sometimes, the slightest (or simplest) questions could spark tons of engagement. Want another psychology related news? Humans are tempted to answer questions and all you need to do is to ask! Call-to-actions or CTA in short, it is a much needed strategy if you are focused in creating the perfect Instagram post. The sky is the only limit you have when it comes to call-to-actions. Depending on the topics, you can easily turn common Instagram posts into great lead generation for your business. Note: It is important to understand that call-to-actions (or CTA) should not be used all the time. Use it sparingly. Instagram marketing isn’t solely about the image. Description plays a huge role too in creating the perfect Instagram post. For starters, making sure the description box is filled with quality description. Instead of using 10 to 20 words to describe the post, provide more information and details to the Instagram post. Usually, I would recommend anywhere between 30 to 100 words. Longer description usually represents serious marketing and on top of that, providing more value for your readers. You can also use the description box to share call-to-actions to further boost your engagement rate. An Instagram post isn’t complete without hashtag(s). Let’s face it, hashtags allow your posts to be served to a bigger larger on Instagram. While there are a few ways to promote Instagram posts using hashtag, you need to ensure that it doesn’t look spammy. Add relevant Instagram hashtags into the description and you can do that towards the end of the description. There isn’t a specific, recommended hashtag numbers to use but compared to other social platforms, you can use more than 10 hashtags on Instagram (and still not considered spammy). Generally speaking, going anywhere between 10 to 15 hashtags is a pretty decent and common thing to do on Instagram. 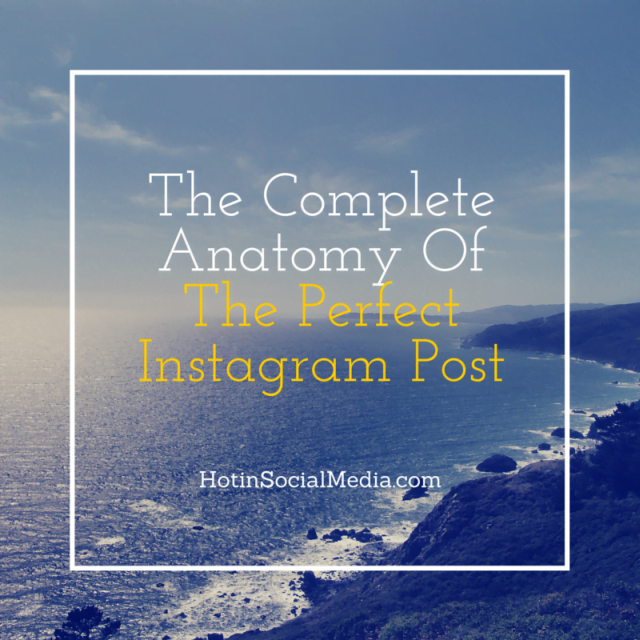 There are many factors that contribute to a perfect Instagram post. Before you decide on Instagram marketing, ask yourself if you are targeting the right audience. Most importantly, do you have the right audience in mind. Solving this question doesn’t only helps you to focus on a smaller, more precise targeted audience, it also allows you to create the right Instagram post that will tickle your audience’s mind.